Style 206 EZ-FLO® expansion joints contain a single wide flowing arch, eliminating the need for filled arches on slurry services. Suitable for high pressure applications, their self-flushing design eliminates media buildup and reduces fluid turbulence. Style 206 EZ-FLO® can be designed to meet the requirements of ASTM F1123 and Navy/Coast Guard Specification 46CFR56.60-25(E). Max temperature rating is based on tube, body and cover materials. To determine, find the minimum temperature based on materials selected. Body Material | Max. Temp. Liner and/or Cover Material | Max. Temp. Note: Not all materials are available in all configurations. Contact Garlock to inquire. Note: Pressure and vacuum ratings at neutral FF dimension. 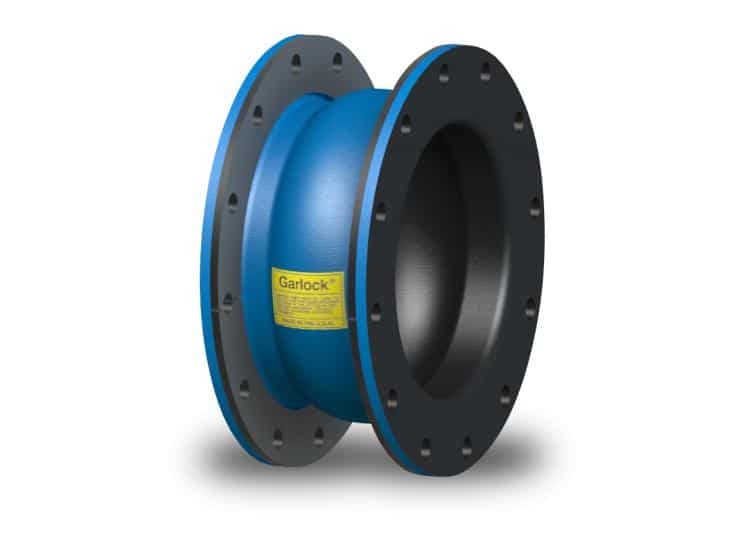 Extended face-to-face dimensions result in reduced pressure and vacuum ratings for Style 206 EZ-FLO® expansion joints. Tube — Standard chlorobutyl liner extends to outer edge of the flange for excellent chemical resistance. The flowing arch design adds pressure resistance and reduces product buildup. Seamless tube creates a positive flange seal without gaskets. Body — Rubber impregnated tire cord and polyester cross-wrapped in bias-ply construction. Cover — Homogeneous layer of chlorobutyl elastomer extends to the outside edge of the flange. Coated with a weather-resistant protectant.